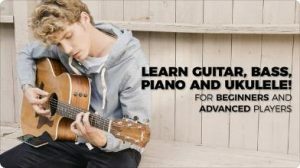 YOUSICIAN – the fast, fun way to learn, play and master the piano, guitar, bass or ukulele. Enjoy thousands of songs on your REAL INSTRUMENT! Yousician is your personal music tutor for the digital age. Learn at your own pace, whenever and wherever you want. The app listens to you play and gives instant feedback on your accuracy and timing. Our curriculum, designed by expert music teachers, will help musicians of all levels improve, from complete beginners to professionals. Over 1,500 missions & exercises, with hundreds of videos, covering all the skills you need: sight reading sheet music, classical and pop songs for Piano, and for Guitar and ukulele you’ll learn chords, strumming, melodies, lead, fingerpicking and more. Yousician also teaches you music theory and Includes special trainers for each skill & chord. A Weekly Challenge, where you can compete with friends and millions of Yousicians worldwide. Yousician is played with a real instrument, and requires no additional equipment. The microphone listens to you play and the app tells you how you’re performing. Unlimited playtime across all platforms. These prices are for US. Pricing in other countries may vary. Your Yousician Premium subscription will automatically renew at the end of each term and your credit card will be charged through your iTunes account. You can turn off auto-renew at any time from your iTunes account settings but refunds will not be provided for the unused portion of the term.